The Communist Party of Australia (Marxist-Leninist) condemns US imperialism’s “recognition” of Juan Guaidó, a US puppet who has unilaterally and illegally declared himself to be “President” of Venezuela. The “recognition” of this enemy of the Venezuelan people comes after years of US sanctions and other forms of economic disruption and political harassment and subversion, all aimed at overthrowing the democratically elected President of the Bolivarian Republic of Venezuela Nicolás Maduro and his anti-imperialist government. US imperialism cannot tolerate the existence of governments that defend state sovereignty against imperialist finance capital, especially when such a government sits on top of proven oil reserves amounting to 300,878 million barrels. This is far bigger than those of Saudi Arabia at 286,455; Iraq at 142,503; Russia at 80,000; and Libya at 48,000. US imperialism sees the oil reserves of Venezuela in the context of its long-term plan to counter the rise of China by military means. It also seeks to remove from its Latin American “back yard” any government which seeks to survive its destabilising efforts by cultivating closer economic and political ties with China – hence it can kill two birds (securing oil and removing Chinese influence) with the one stone of the overthrow of the Maduro government. The Chavistas in Venezuela did not come to power by means of a proletarian revolution. The situation they now face is one in which the old machinery of state was inherited electorally and so remains available for use by the reactionary forces of the rich and their backers, the US imperialists. The power of the old ruling class was curtailed but not destroyed. With an aggressive, fascist US ally to the west, (Columbia), and a fascist-led, pro-US government now in place to the South, (Brazil), Venezuela is effectively surrounded by unfriendly states that will support US aggression one way or another. Colombia, for example, which now has over a million Venezuelan refugees within its borders, was complicit in an assassination attempt on Maduro last August carried out by a drone used by right-wing Venezuelans in Colombia. Venezuela’s only other neighbour, Guyana is unlikely to be supportive either as it has a border dispute with Venezuela over territory both sides claim. 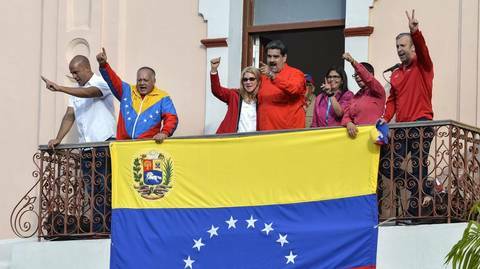 Despite the economic misery imposed on Venezuela by order of US imperialism, there is evidence that Maduro still has the support of the poor and working masses, who are currently holding pro-government and anti-US rallies in the streets. At the time of writing, the Venzuelan armed forces leaders have pledged their loyalty to Maduro. Venezuelan Defense Minister Vladimir Padrino said Wednesday that the country's military will continue to defend the Venezuelan constitution and national sovereignty, and would not accept an "imposed president”. Regrettably, some Latin American countries have turned their backs on Venezuela and shown their subservience to US imperialism by “recognising” its puppet “president”. Regrettably, so too has Canada. It is probably only a matter of time before the US puppets in Canberra do likewise, with Foreign Minister Marise Payne saying yesterday that the move was “under consideration”. For our part, we declare our support for President Maduro and condemn the criminal US imperialists. Australia must not interfere in Venezuelan affairs and must respect the democratically-expressed will of the Venezuelan people. Bougainville Referendum: A crisis looming for US in the South Pacific?